In regards to the escalating sovereign debt crisis in Europe, most eyes have been focused on Greece, Ireland, Spain, and Portugal, the so-called PIGS. Dr. Evil, a former government bond trader for a very prominent bank pinged me regarding my post PIGS Exposure Table, Explaining the Panic by Numbers. Her message was to pay more attention to the second "I" in PIIGS, namely Italy, the "invisible elephant". I just saw your table on the PIGS and I see the biggest one of all missing, ITALY. I traded Euro Government bonds for 11 years and know this market inside out. Spain is a big one should it go but Italy has a cool 2 Trillion EUR in debt and has much worse debt statistics than Spain. Italy's debt-to-GDP ratio is 118% (2009). Greece got in trouble at 116%. Italy's deficit is smaller and has a high savings ratio. However, nobody focuses on that as Spain is in the limelight with a debt-to-GDP ratio under 60%. Should austerity measures result in a nominal GDP contraction in Italy, its debt stats will worsen very rapidly. Italy is the elephant in the room not Spain. 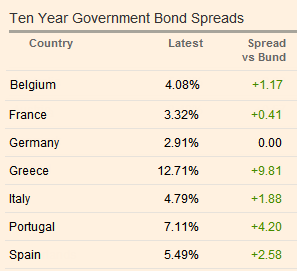 Let's take a closer look at sovereign bonds spreads in Europe, comparing German 10-year government bonds to Italian 10-year government bonds. Since mid-October, German 10-Year Government bond yields are up .64%. 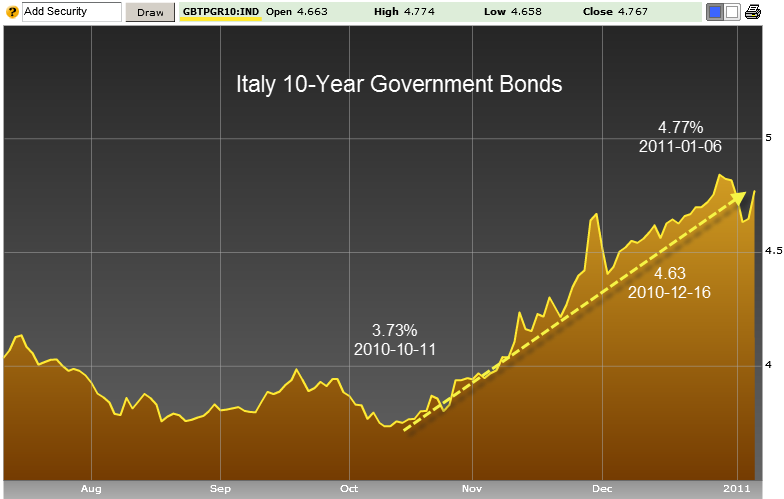 In the same timeframe, Italian 10-Year Government bond yields are up 1.04%. The flight-to-safety divergence increased starting around December 16, 2010. 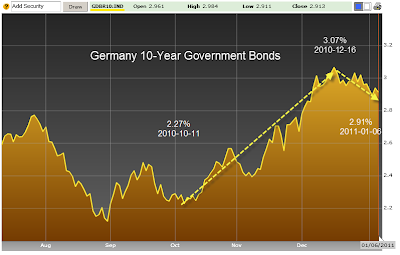 Since then, German bonds yields are off .16% while Italian bond yields rose .14%. 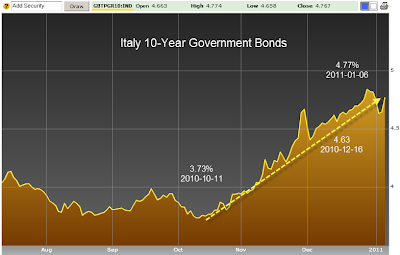 On January 7, 2011 the German-Italian spread government bond spread is 1.88% and rising. Table is courtesy of the Financial Times. Here is an interesting chart courtesy of the New York Times regardingEurope's Web of Debt that helps explain the picture. The graphic is from May, 2010 so it's a bit dated. However, it does explain the interrelationships quite nicely. Note that Italy owes France a whopping $511 billion, 20% of the French GDP. 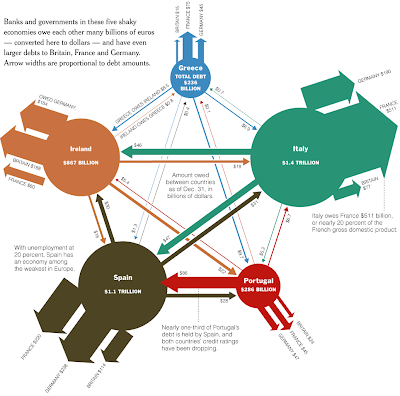 Moreover, nearly 1/3 of Portugal's debt is held by Spain. Meanwhile Spain owes huge amounts to Germany, France, and the UK. Do you think all of that will be repaid? I don't. In Feb 2011 the German court gives its verdict on the constitutionality of the bail-out. Fifty academics and politicians sued the government over it. February is crunch time. For more details please see EU Commission Plans Haircuts on Bank Debt; Greek Yields Hit New Record; China Buys Spanish Debt; German Courts to Decide Bailout Constitutionality. If the German courts uphold the constitutionality of these various bailouts, the crisis is merely pushed a bit further down the road. In March a new Irish government will take over and it is highly likely that government questions the hundreds of billions Ireland owes German, French, and UK banks. 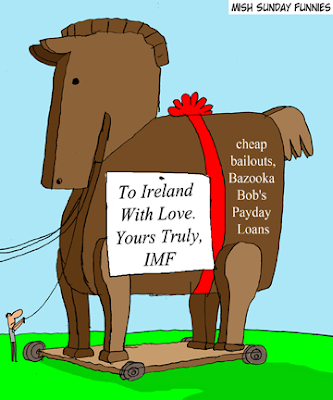 I believe Ireland should tell the ECB and IMF to go to hell and default. For my rationale, please see To Ireland With Love. Here is the "Trojan Horse" image I used with the article. In a subsequent email, Dr. Evil elaborated on Italy's off-balance sheet debt. If Italy were to go into a nominal GDP recession on account of its austerity programs, its debt-to-GDP ratio would likely be 130% by 2012. It's difficult to see how the market would ignore that. Also check out Italy's debt compared to Germany. Here is the official EU Gross Government Debt Figures by country. Note that as of 2009, Italy's Debt is 1.763 Trillion EUR, about the same as Germany. Obviously the German economy is far bigger. Moreover, I assure you that Italy has a lot of off-balance sheet debt. Some European countries took some very creative measures to reduce interest payments on debt. Italy was one of those countries. I have seen Italy do HUGE (10+ billion USD) derivative transactions. Those transactions were all off-balance sheet but the cash flows behind the transactions were very real. Italy was the number 1 customer for big investment banks in London for years. You won't find anything about that in the press. In 2011, Italy will need to rollover a pile of debt. It will be interesting to see how that goes. I believe that if the 10-year yield hits 6%, an irreversible snowball effect similar to what Greece and Ireland went through is likely. Inquiring minds are reading Italian Public Securities By Maturity to see how much debt Italy will need to rollover in 2011. A quick look at page 3 totals approximately 281 billion in euro debt rollovers. Assume a 5% budget deficit on a GDP of roughly 1.5 trillion euros and you end up with 281 + 75 billion or roughly 356 billion euro total debt issuance. Will the market accommodate that issuance at a good interest rate? If not, the "Invisible Elephant In The Room" will quickly make its presence known in a rather rude manner. Almost two years after Citigroup Inc. riled the dozen countries in Europe's government bond market with secret trades code-named Dr. Evil, the debacle is hurting shareholders of the world's largest financial institution. Citigroup arranged just 2.3 percent of the 155 billion euro ($196 billion) in debt sold by the governments since it unleashed Dr. Evil on Aug. 2, 2004. That's little more than a fifth of its market-leading 10.1 percent share in 2003, data compiled by Bloomberg show. And while the $26 million fine Citigroup paid was the equivalent of a rounding error on annual earnings, the New York-based bank has lost the chance to win lucrative fees for handling sales of state assets, such as France's $7 billion stake in Groupe Caisse d'Epargne; Citigroup is now 14th among advisers on European privatizations, down from third. German financial market regulator Bafin referred the case in January 2005 to a public prosecutor, who decided against pursuing the case "for legal reasons," said Anja Neukoetter, a Bafin spokeswoman in Bonn. France's Autorite des Marches Financieres passed its evidence to the U.S. Securities and Exchange Commission, said Sabine Baudin, a Paris-based spokeswoman at the AMF. Thomas Maheras, 43, Citigroup's head of global capital markets, acknowledged in a memo to employees that the bank's conduct wasn't above reproach. "We regret having executed this transaction," Maheras said in the memo, which was distributed to news organizations in September 2004. "We failed to fully consider its impact on our clients, other market participants and our regulators."